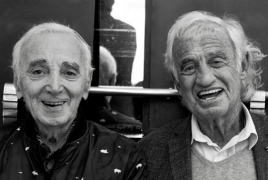 One day before his death on October 1, legendary French-Armenian croonerВ Charles Aznavourpublished a last picture on his Instagram with French actorВ Jean-Paul Belmondo. "My lifelong friend John Paul," Aznavour captioned the photo. Aznavour died at 94 after a career lasting more than 80 years, a spokesman has confirmed. Fans and admirers worldwide have been holding candlelit vigils all around the globe to mourn the passing of the beloved singer and songwriter.